Latisse is the same formula as Lumigan, Allergan’s eyedrops for glaucoma, which reduces eye pressure but also happens to grow lashes. Both are also known as bimatoprost ophthalmic solution. In early 2009, Allergan introduced the drug as a lash enhancer. A former primary care doctor runs www.latisse.bz, which boasts that it is the “largest Latisse retailer.” All it takes to get Latisse mailed out — without ever seeing him — is filling out a medical history, which he reviews, and typing in a valid credit card number. But if people use Latisse without seeing a doctor, the side effects may come as a big surprise. Eyelid discoloration “may be reversible” according to the manufacturer. A rare side effect that has captured the most attention is the chance that one’s hazel or blue eyes could turn brown — forever. Long Lashes Without Prescription, but With Risks. NYTimes, 2010. 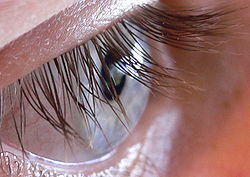 Image source: Eyelashes, Wikipedia, Steve Jurvetson, Creative Commons Attribution 2.0 Generic license. Latisse is a drug used to treat glaucoma. One of the side effects is longer lashes, but is not meant to be used in that manner. Another side effect is a browning of the iris. Drug makers should stop tweaking drugs and passing them off for other uses, In my opinion it is a dangerous thing to do.